It’s not you, Jane. It’s me. I can only attribute it to mental failure resulting from my advanced age. I thought I was doing a pretty good job keeping the brain nimble by doing challenging mental work. But if that’s true, how do I explain being unable to read Jane Austen’s Emma? I’ve read Austen in the past. I recall enjoying Pride and Prejudice quite a lot. I made it through Sense and Sensibility, which I’m told is not the author’s best. Everyone speaks well of Emma. But I couldn’t bear it. It bored me sick. I didn’t find much to like in any of the characters, except perhaps Mr. Knightly – and he isn’t around that much in the first fifth of the book, which is as far as I got. I especially disliked Mr. Woodhouse. Since I subscribe to the Law of Perverse Criticism (a theory of my own invention, which says that anything that really irritates you is probably something you do yourself), that indicates I’m probably a lot like that fussy old man. I hereby turn in my Literary Snob card. I hang my head in shame. Now I’m reading a book about the Lewis Chess Men. That one’s keeping my lowbrow interest. Women don’t think the same way men do, generally speaking. That’s good and even godly, because the Lord created us in his image, male and female in his image. Our differences matter as mature adults designed to worship the Lord on earth. If there is a tendency to value enduring relationships over abstract ideas in the ethics valued by most (though not all) women, then Austen is an educator in that voice. She must not be reduced to entertainment, though she is good fun. She is wrestling with status, relationships, and how to morally negotiate status ethically. In other news, Jane Austen’s letter hilariously mocking a gothic novel will be auctioned for the first time at Sotheby’s tomorrow. I am fond of Jane Austen, though I’ve only read two of her novels. I’m a huge fan of Whit Stillman. 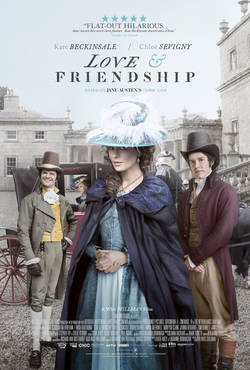 So when I review his latest effort, Love & Friendship (which looks like it might be the big hit he’s deserved for so long) my perspective is that of viewing Austen-land from Stillman-land. This is probably fairly unusual. People have noted the similarities between Stillman’s work and Austen’s books from the beginning. Metropolitan, his first movie, is self-consciously Austenian, a point paradoxically emphasized by the main character’s insistence that he’s never read Jane Austen because he prefers to read literary criticism of her. That’s an exquisitely Austenian comment on Austen. And that’s what we also have in Love & Friendship, based on an Austen novella, Lady Susan. It’s meta-Austen. It tells its story, comments on the story, and laughs gently at its comments. It’s a lot of fun. It might be the perfect movie through which to introduce an intelligent consumer who’s not familiar with Austen’s work (I’m sure there are such people; I’m almost one of them) to her world. Lady Susan (Kate Beckinsale), the main character, is “the most notorious flirt in England.” A young and beautiful widow, we meet her in a silent-movie preface (with subtitles) in which she is driven from the home of a relation, having broken hospitality by seducing the man of the house (she thinks this response shockingly unjust). She then goes to stay with other relations, where she attempts to win a handsome younger man as her own husband while scheming to marry her virtuous daughter off to the stupidest man in England, James Martin (Tom Bennett). Bennett’s scenes are the funniest in the movie – he’s Wodehousian in his affable ignorance. He’s certain there are Twelve Commandments (general ignorance of the Ten Commandments is a running joke in this movie – a comment, I assume, on our own times). Lady Susan is Donald Trumpian in her invincible self-regard and lack of concern for the feelings of others. She’d be unbearable if forces of cosmic justice, acting behind the scenes, didn’t conspire against her machinations – something she would deeply resent if she were aware of it. I liked Love & Friendship a lot, and suspect I’ll like it more when I’ve seen it a few more times (which I’m sure I will). I was pleasantly surprised by the crowd at the showing I attended – much larger than I expected, and mostly gray-haired, people who I suspect don’t go out to the movies much anymore. Highly recommended. Not for kids, because much of the humor is sexually sophisticated (though not smutty at all), and because the vocabulary hovers at a high altitude. Are Literary Mash-ups a New Horizon for Publishing? Is the literary mash-up a passing fad or a fertile new genre? The art of mashing up involves putting together two completely incongruous genres, only to discover that something in the high-cultural original matches the low material with which it is mixed. In Pride and Prejudice and Zombies the Bennet girls prepare themselves for encounters with the undead just as enthusiastically as they prepare themselves for husband-hunting in the original. The Guardian’s John Mullan suggests several ideas, like this mashup of Paradise Lost and X-Men. John Milton was surely a super-hero bard avant la lettre. All those angels tumbling from heaven’s crystal battlements, flying across the universe to visit Earth. Think of the war in heaven, where the fallen angels pit “their engines and their balls / Of missive ruin” against the less well-armed Cherubim. It could surely have profited from the involvement of Wolverine and Gambit, while Satan’s concordat with Magneto would challenge the Archangel Michael, even with his sword that “felled / Squadrons at once, with huge two-handed sway”. My sister has directed my attention to “a modernized adaptation of the classic Jane Austen novel, Pride and Prejudice . The story is told primarily through Lizzie Bennet‘s Video Diaries, while being supported by her and other characters social media streams.” There are fifteen short episodes so far (you can start here), and from what I’ve seen, they are cute, funny, very contemporary, and very girly. With Jane Austen as source material, how can this lose? Multiple characters are chatting on Twitter, and those conversations are being collected on Lizzie’s tumblr site, if not elsewhere, and with the many links to clothes and styles, like all the kids do nowadays, perhaps the creators of this show can actually make some money. Do people actually make money off the Internet? That is so 90s. To young men of a studious turn of mind, who did not desire to go into the Church or the Law, magic was very appealing, particularly since Strange had triumphed on the battlefields of Europe. It is, after all, many centuries since clergymen distinguished themselves on the field of war, and lawyers never have. It is my settled custom to delay discovering great novels until everybody else has already praised the life out of them. 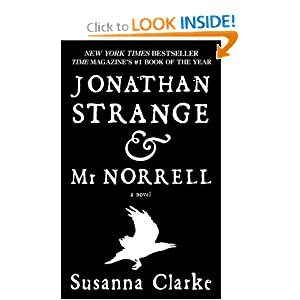 And so it is with Susanna Clarke’s Jonathan Strange and Mr Norrell . A marvelous, original conception carried off with what looks like effortless grace, Jonathan Strange and Mr Norrell is a sprawling, lengthy epic in the heroic fantasy vein, but set in early 19th Century England and narrated in a style reminiscent of Charles Dickens and Jane Austen (and probably other Victorian authors of whom I’m ignorant. I was always a little weak on my 19th Century English fiction). If you’re looking for headlong, fast-paced adventure, this is not the book for you. This is a leisurely book, whose pleasures are subtle ones. I found it totally delightful. You can write an interesting contemporary novel based on the “Anna Karenina” template in which the heroine gets a divorce, marries her modern-day Vronsky, and they both discover that they’re unhappy with the choices they’ve made — but the last act just isn’t going to be quite as gripping as Tolstoy’s original. You can turn the Jane Austen template to entertaining modern purposes, as Hollywood did in “Clueless” and “Bridget Jones’ Diary,” but the social and economic stakes are never going to be as high for a modern-day Elizabeth Bennet as they were for the Regency-era version. I think he’s got something there. If you want to write a novel about, say, an unwed mother, you can suggest that your plucky heroine’s Neanderthal, Bible-thumping parents don’t want her to have an abortion, but there’s really nothing they can do to stop her. The only other problem her romantic passions are likely to get her into is that of sexually transmitted diseases. In that case, she either takes medication to get better, or she’s stuck with the problem for life. There’s little scope for her to heroically defy convention and shame the small minds; there is no convention to defy. P. G. Wodehouse wrote stories about couples being kept apart by unsympathetic fathers and guardians, well past the point in history when such parental figures had “sunk to the level of a third rate power” (to quote “Uncle Fred Flits By”). He was able to get away with it because his stories were light confections, not intended to reflect real life in any serious way. If he’d been forced to be realistic, the fun would drained out like water from a lion-footed bathtub. Is it an indictment of modern society to say that it doesn’t offer scope to certain forms of fiction? Probably not. But I often think of the popularity of Amish stories in the Romance genre, as I’ve mentioned here before. I don’t think it’s unrelated to highbrow authors writing historical novels. I think there’s a hunger out there to be able to live in a society where people care enough about you to tell you when they think you’re messing up your life. The autonomous life, in the end, is a pretty lonely one. It would be pointless and overweening for me to “review” Sense and Sensibility, a book many of you probably read long ago, and one which has been well appreciated by far more discerning readers than me. So let’s just call this a reader’s report. I read Pride and Prejudice quite a few years back, and promised myself I’d return to Jane Austen again. The delay of more than a decade is probably best explained by the fact that Austen is a fair amount of work. To take one example of words that have changed in meaning since the early 1800s, in Austen the word “address” means the way you present yourself when conversing with other people. The notation on the outside of a letter, telling the postman where to deliver it, is called the “direction.” I have a pretty good vocabulary and can work my way through, but I’ll admit I had to go over a few of the sentences more than once, not only because of word choice, but because the diction could get pretty convoluted. But the book rewarded the work. There were a number of very funny lines, delivered in a charming dry manner, scattered among the verbiage. I’d share one or two, but I returned the book to the library this afternoon when I’d finished it. What particularly delighted me in Sense and Sensibility was the sweet reason of the whole thing. In utter contradiction to what a guy expects in a love story written by a woman, the most sympathetic character is the most circumspect one; a woman whose feelings are so well concealed that I wasn’t sure until the end which male character to root for her to marry. The author, apparently, approves of this. Marriages should be well thought out, and entered into with a due consideration of prudential matters like social class, education, good taste and income. And love, of course, but don’t get carried away. The screenwriter for a new British TV drama called, “Miss Austen Regrets,” wants the show to depict a realistic woman as Jane Austen. “She was lively and ferocious. Some of the comments about her neighbors make your eyes water,” writer Gwyneth Hughes said. Anne Hathaway almost quit her starring role as Jane Austen in Becoming Jane over stress, according to Reuters. After making only minor changes, he sent off opening chapters and plot synopses to 18 of the UK’s biggest publishers and agents. He was amazed when they all sent the manuscripts back with polite but firm “no-thank-you’s” and almost all failed to spot that he was ripping off one of the world’s most famous literary figures. I love this kind of experiment, but hasn’t this been done before with another classic author? I don’t remember the specifics, but I think I’ve heard about someone doing this very thing a few years ago.